Ahaz Augustus Gray was born on September 7, 1881 in Carroll County, Georgia. Although his parents, Matt and Eliza Gray, were not musicians, Ahaz, as he was known to his friends, had an older brother who played the fiddle, and it was he who taught the younger brother the rudiments of the instrument. 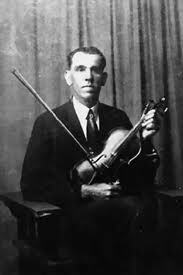 In 1934, Ahaz described his musical instruction to Willard Neal of the “Journal”‘s Sunday Magazine: “I guess I’m different from most of the fiddlers. Nearly all the others learned to play naturally, but I had to be taught. When I was seven years old my big brother started me off. He had to poke my fingers down on the strings and hold them there while I sawed with the bow. He taught me part of a piece, and then got mad because I couldn’t learn any faster, and quit, but I kept trying ’till I picked out the whole tune. And I’ve been playing ever since.” Ahaz was apparently a faster learner than his brother had realized since, according to family tradition, he played for his first dance when he was between seven and eight years old. At the age of twenty-five, Gray married Ida Clarinda Smith in a ceremony that took place in Buchanan, the seat of Haralson County. Sometime after their marriage, the Grays moved to a rural community near Tallapoosa, some eight miles southwest of Buchanan. They spent the remainder of their lives in and around Tallapoosa where Gray earned his and his family’s living by farming and fiddling. They had three children, two boys and a girl.